Cupcakes that are cookies … or cookies that are cupcakes… what could be better? I made these cookies for my friend Jan. It was her birthday and I brought these cookies as party favors for the “girls’ night out”. Jan and I worked together for about 15 years at a cake and candy supply store. Jan was a cake decorating teacher and as the photo shows, I was not! In my mind, I can make straight lines and perfect swirls. Somehow my hand doesn’t receive the message of perfection that I visualize! So, I have decided that my designs are quirky and whimsical … and don’t drive myself crazy … or crazier … striving for perfection (although if it happens, I won’t complain). As long as it is sweet and simple, I am a happy camper! 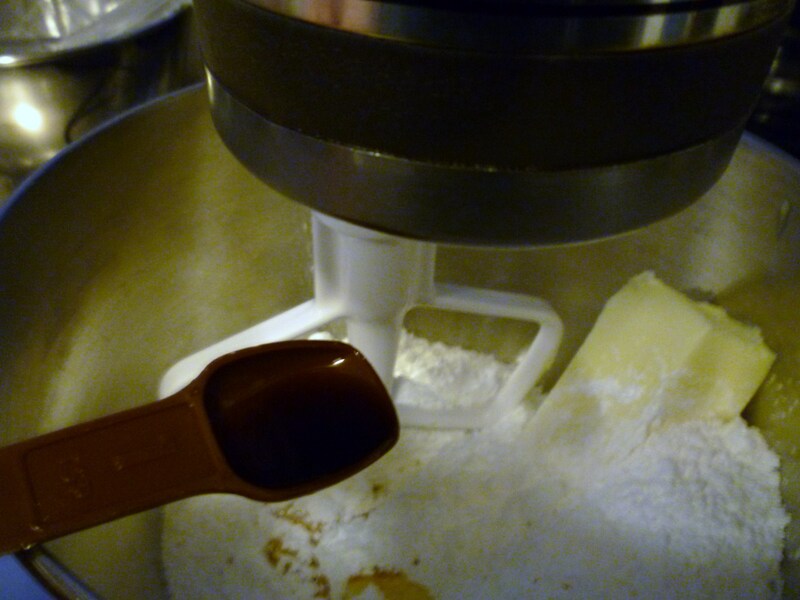 In a large mixing bowl, cream together butter, vanilla and powdered sugar. Add flour and salt. Mix until blended. Mixture will be stiff. 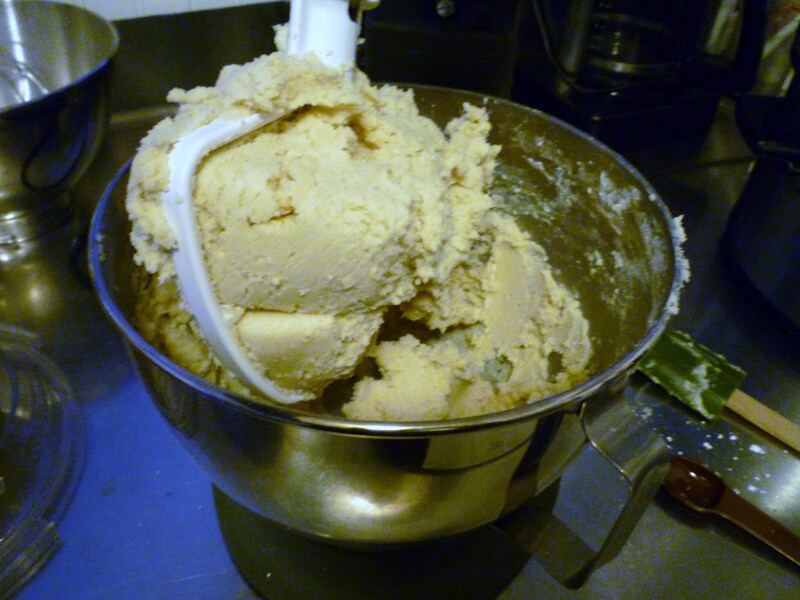 If you feel that the dough is too soft to roll, you could cover the dough and refrigerate it for a short time. 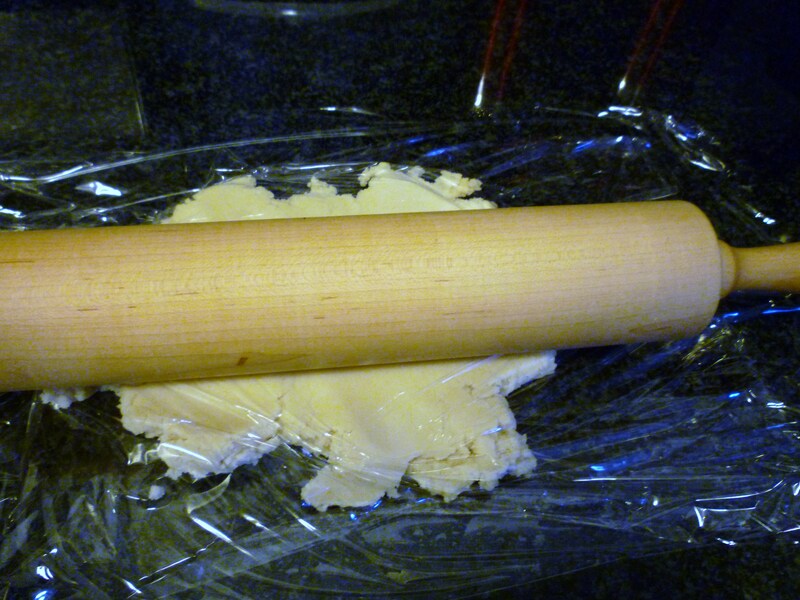 Otherwise, let’s get rolling… You can do this the old school way … roll the dough on a lightly floured surface … or the simple and less messy way … roll the dough between sheets of plastic wrap (my preference). Roll the dough to about 1/4-inch (or less if you prefer) thickness. 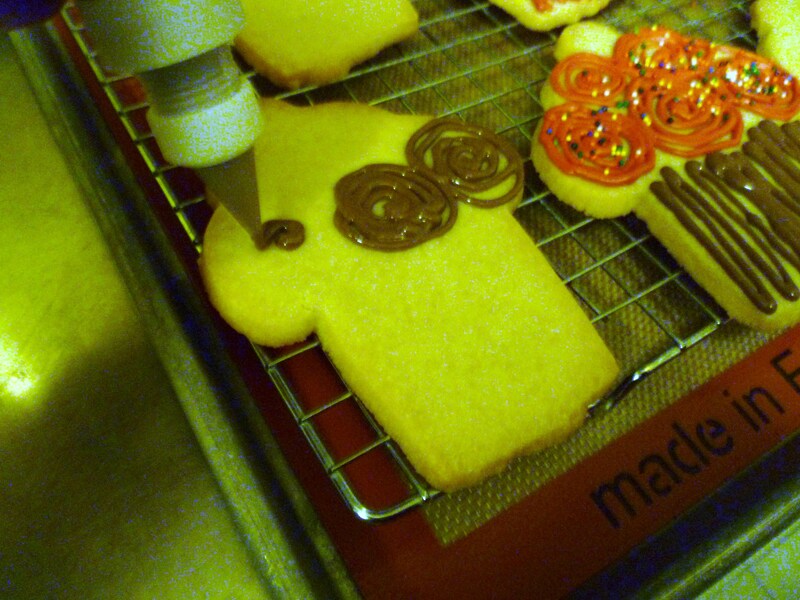 Cut the dough, using your favorite cute cutter! Save the scraps, they can be reused! Place your cookies on an ungreased cookie sheet. I prefer to use a silicone baking mat (Silpat), but parchment paper works well too. Pop these little guys into a 350° oven (that I forgot to tell you to preheat) for about 12 minutes or until lightly brown on the edges. 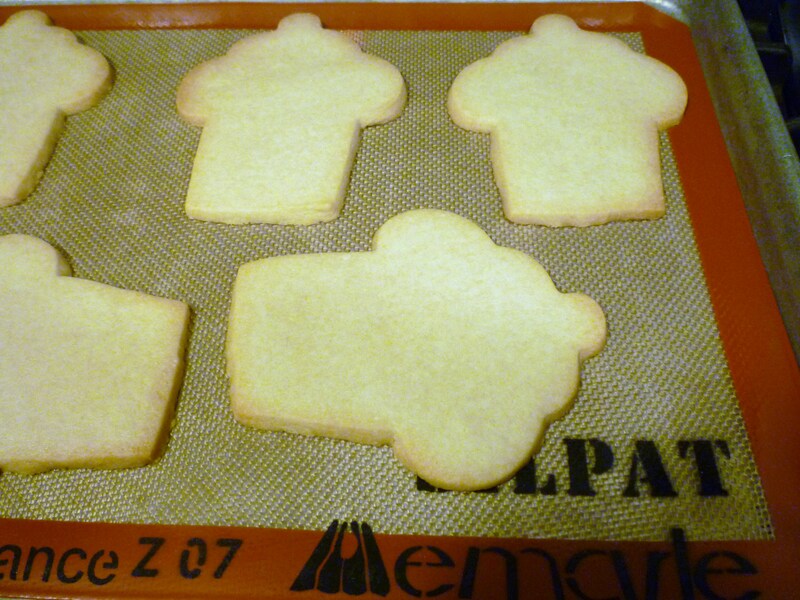 Let them cool for a few minutes before you remove them to a cooling rack. Now the fun decorating begins!!! 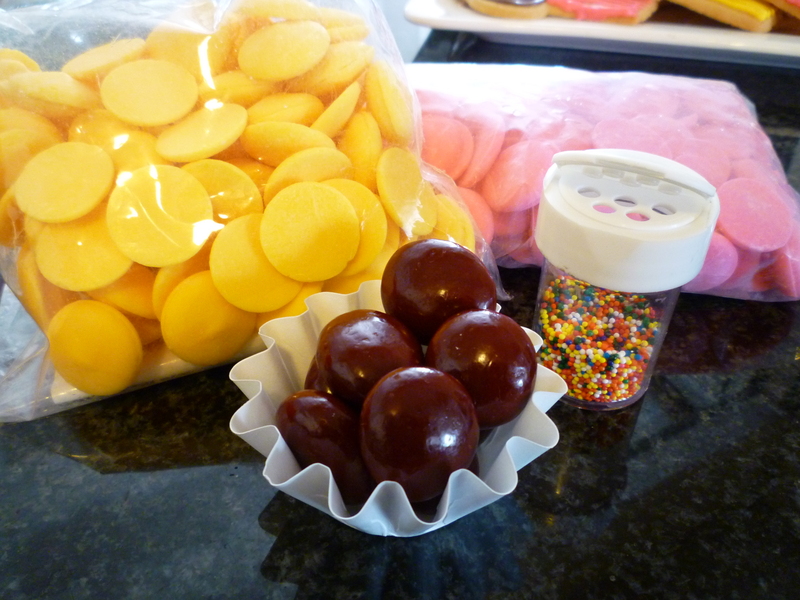 This is what you will need – chocolate covered cherries (the kind that are dried cherries, dipped in chocolate and colored red), sprinkles and melting chocolate. Instead of traditional royal icing, I like to use candy wafers, molding chocolate, candy melts (they are known by many names). 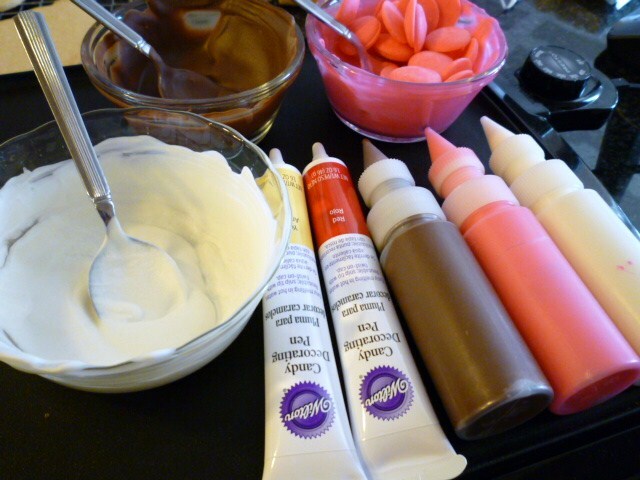 I choose candy because – it is easy to work with, sets up quickly and I think it tastes better than royal icing. The candy is usually available at cake decorating stores or craft stores (Joann’s, Michael’s etc.). You can buy candy melts in bags, melt it and pour into squeeze bottles … or buy “candy decorating pens”. Just melt the candy according to the package … or in the microwave on medium power for short (30 seconds) intervals, stirring between … or on an electric skillet/griddle at about 150° (where the light comes on) … or in a double boiler – bring the water to a boil, remove it from the heat, then place the pan/bowl of candy on top. Whatever method you use, just make sure that you don’t overheat the candy. You should always be able to hold the bowl in the palm of your hand comfortably. Now, using your very best artistic abilities (or just wish for luck .. like I do), start squeezing lines, swirls, dots , whatever floats your boat! Remember to add the sprinkles while the candy is still wet. Now, the finishing touch … the cherry on top! 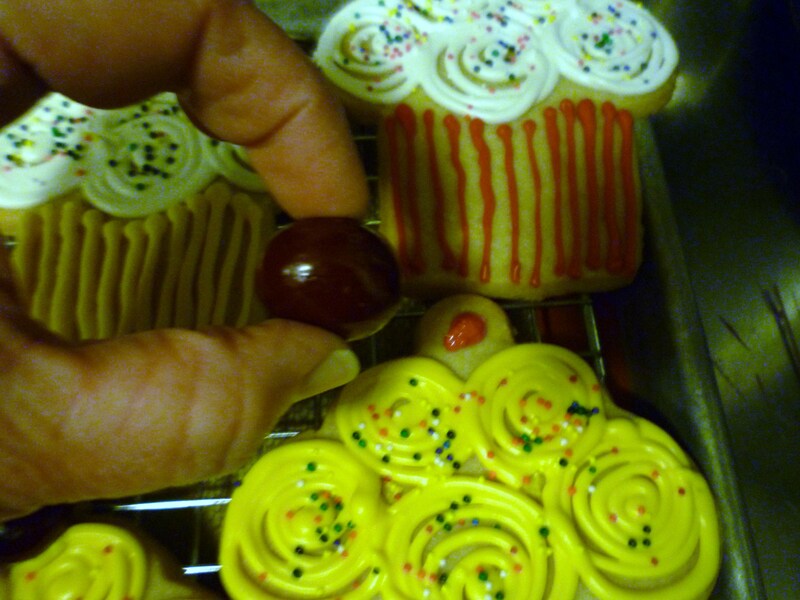 Attach the cherry on top of the cookie using the melted candy as the “glue”. I hope that you enjoy making, eating and sharing these shortbread cookies. 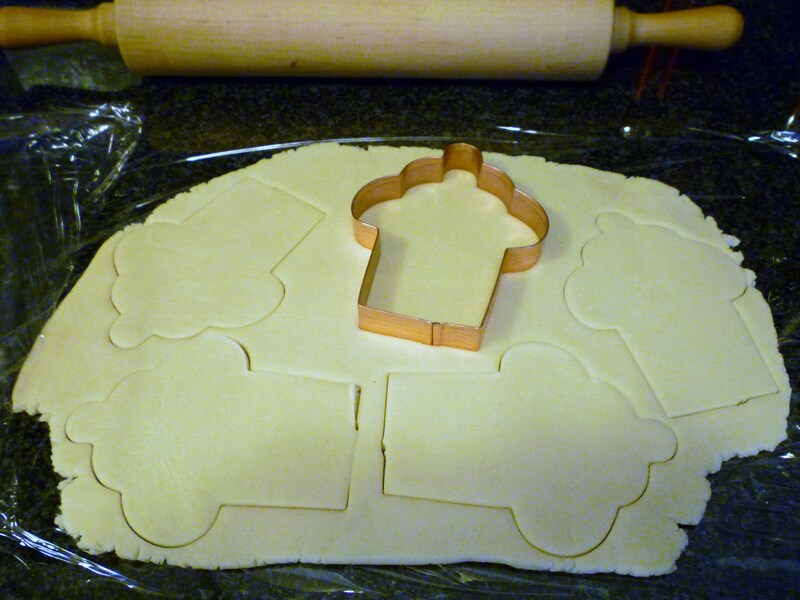 This cupcake cookie cutter is rather large (4″ x 5″) and I got 19 cookies out of this recipe. The cutter is made by Old River Road. Here is the recipe that I received many years ago from my friend, Jane. Cream together the butter, vanilla and sugar. Add the flour and salt. Mix until blended. Mixture will be stiff. If necessary, cover and refrigerate the dough for a few minutes. At this point, the dough could be wrapped well and saved for future use. It keeps for weeks in the fridge. When you are ready to use it, remove from fridge and set it out until it softens. Roll the dough, on a lightly floured surface or between sheets of plastic wrap, to about 1/4″ thick (or a little thinner). Cut into desired shapes. 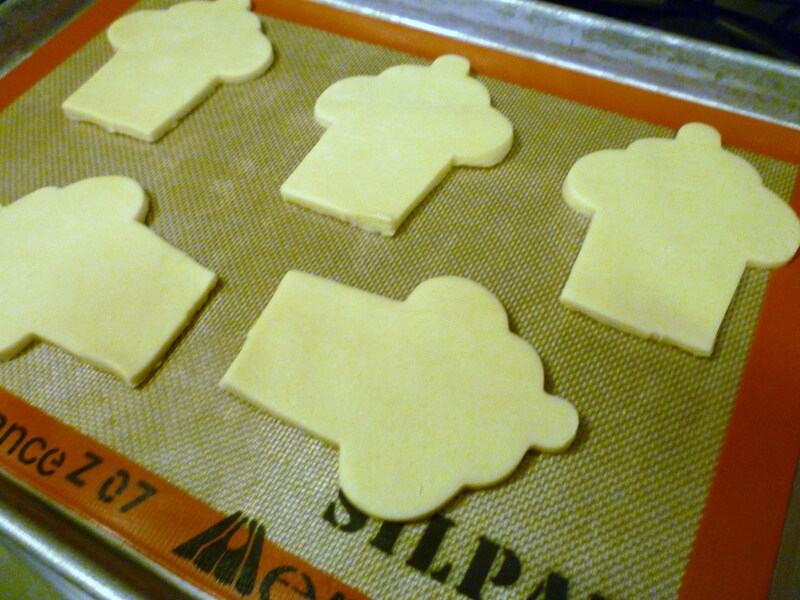 Place on an ungreased cookie sheet, parchment paper or silicone baking mat. Bake at 350° for about 10 – 12 minutes. Makes about 18-20 really big cookies. I should mention that this is my first post. Your comments will be appreciated. Thank you! So adorable. I love the cherry on top, so clever. They were so tasty too. Love the blog, can’t wait to see what you do next. What would a cupcake be without a cherry on top? I love the cupcake cookies! They are the cutest cooikes I have ever seen. 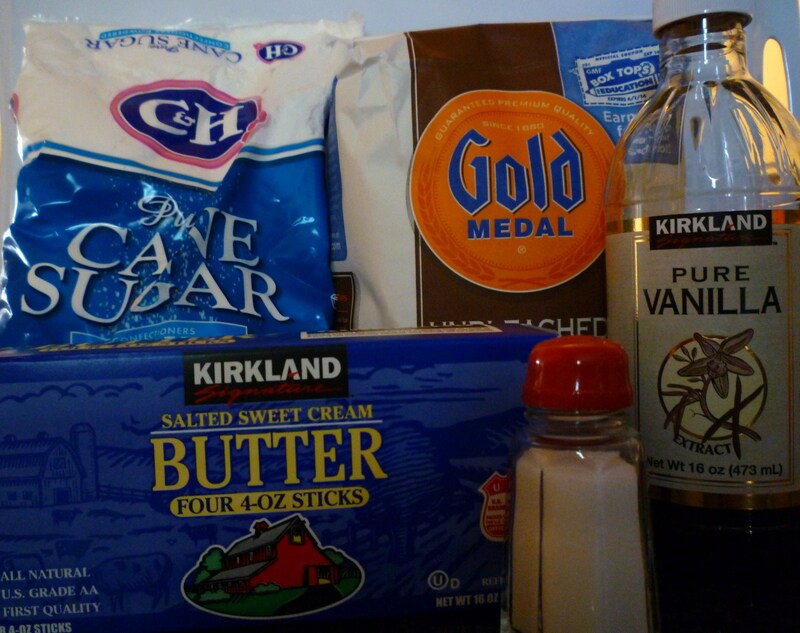 The instructions are easy to follow and I cant wait to make my cookies this weekend! Love the Blog!! I am happy that you like them! Have fun making your cookies. I’m so excited about your blog, and the sharing of your recipes. I think you should post old pictures too. It would be fun to show older creations as well. My friend just got me hooked on the Pioneer Woman last week. I can’t wait to spend hours looking at your blog! Yeah! Love it, Love it…absolutely Love it! Very creative and detailed. Can’t wait to read the next one. Thank you, I am looking forward to doing more posting. Your website seems very easy to follow, even for a beginner like me. Makes me want to bake!! Thank you! These are really easy, I’m sure you can do it! Love the no bake cupcakes! You are so creative. I love these, I also love that you ‘iced’ them with candy melts (never seen it before). I can’t do straight lines as well, but yours look so perfect to me 😉 the ideas on your blog are so simple and cut. love it! 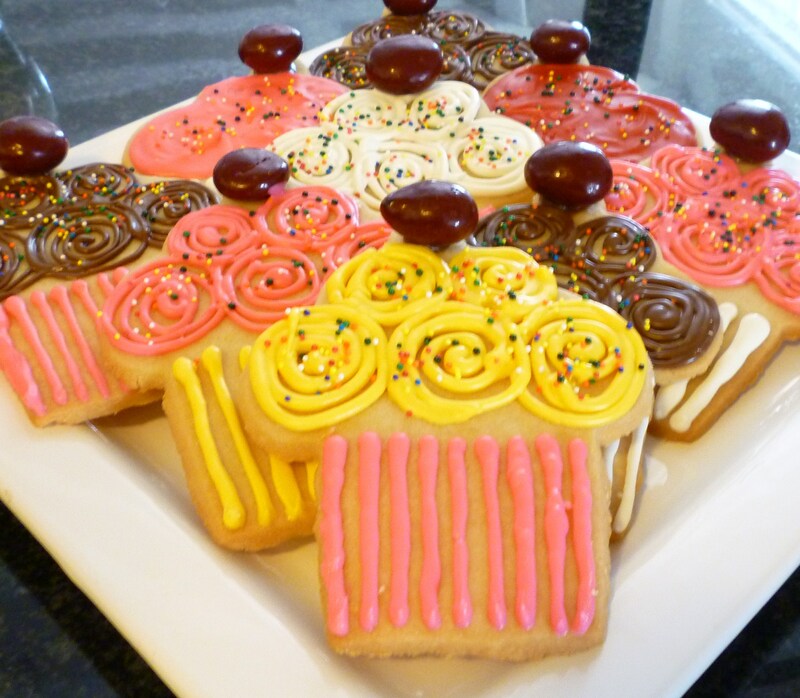 I really enjoy using candy melts to decorate cookies … no mixing … they come colored … the candy is softer than royal icing when dry … and it tastes pretty good.